When the intense and darkly handsome newcomer Finn suddenly turns up at her bedroom window one night her world is turned upside down. He holds the key to her past, the answers to her strange powers and is the doorway to a place she never imagined could exist. Förening, the home of the Trylle. Everything begins to make sense to Wendy. Among the Trylle, she is not just different, but special. But what marks her out as chosen for greatness in this world also places her in grave danger. After reading The Hunger Games, I had such an intense good-read-hangover that I couldn't start another book for a while! 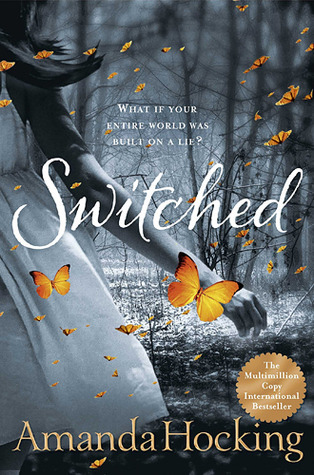 And when I did, all I wanted to read was another young adult trilogy, which is why I decided to download Switched. Once just a self-published novel, Switched grew in popularity and is now distributed by a major publishing house. They've even gone so far as to make two different versions – one cover for young people, and one for adults. Unfortunately, though, I fail to see why this has become such a popular book. I expected something spectacular and well written, but it isn't either one. Wendy, the main character, has very little personality. She's dull and robotic, which is a very big problem considering she is not only the protagonist, but also the narrator. I felt no romantic connection between her and her apparent love interest, Finn, who just seemed more like an advisor and a babysitter. Wendy's people are also some weird version of a troll, which the author has renamed Trylle, and made them into baby stealing, money hungry supernatural beings. Switched was just an all-around disappointing read for me. I would definitely recommend looking at other self-published or titles published by smaller publishing houses first, before considering this (Pyxis by KC Neal and Shelby and Shauna Kitt by PHC Marchesi get honourable mentions). See you later, England. Bonjour, Paris!